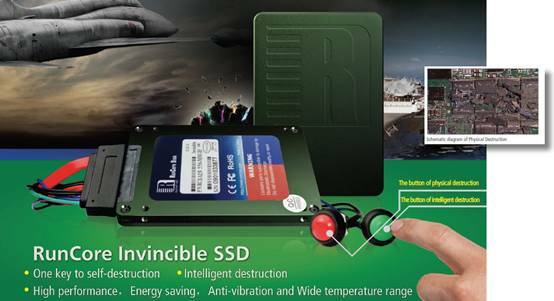 RunCore has given a preview of two soon to be globally available special-use SSDs, the RunCore InVincible with a physical self-destruction mechanism, and the RunCore XAPEAR, allowing for complete remote data elimination through your mobile phone. The RunCore InVincible SSDs allow you to protect your data from third party access in two ways with a single click. One method is the intelligent elimination of all your data through overwriting the entire disk with. A less subtle method is the physical destruction of your SSD by applying an over-current to the NAND flash memory and thereby rendering these. The RunCore InVincible product series is catering to embedded computer systems requiring high-speed serial switched fabric interconnects for rugged design implementation and more flexible power ranges. Delivering optimized storage options particularly in mission-critical fields such aerospace, military and general industrial applications. RunCore’s Xapear is a smart USB 2.0 connected SSD solution with RFID protection, allowing you to split your data into a freely accessible partition, and a hidden partition that only becomes accessible by applying a special RFID key to your SSD. Furthermore, the Xapear offers remote data destruction by simply sending an SMS over your GSM from your mobile device to the integrated GSM receiver, which then will immediately start overwriting all your data and thereby deleting all previous content. After successful data elimination the SSD’s GSM will send a confirmation SMS to your mobile. With these devices your private data protection is entering an entirely new stage of security. This is especially important in an ever more mobile environment were sensitive data and information are frequently being caring along, making it potential risk to being used by unauthorized 3rd parties. With the RunCore InVincible and the RunCore XAPEAR you now have a highly advanced data protection solution, even for the private sector.